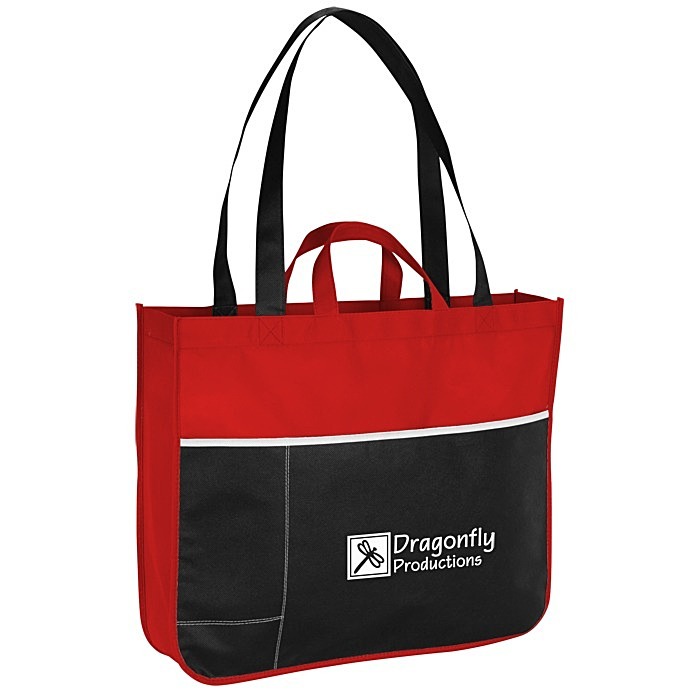 Customers will hang onto your logo with both hands with this trade show bag! Choose your preferred method of carrying with the two grab handles and two 28" shoulder straps. The solid-colored body of this non-woven polypropylene bag is emphasized by white piping and contrast stitching. That contrast stitching actually outlines two extra pockets for business cards and accessories. The larger black front pocket provides additional storage for your most oft-used items. Wide gussets make this customized tote the perfect grocery shopping bag, trade show tote or work bag. Size: 15" x 18" x 4". Your price includes a one-color imprint on the front pocket of the tote. Additional colors available for an additional charge. Set-up charge: add $55 per color.